I don’t really know a lot about Santa Muerte or Saint Death. After I read this article, I remembered seeing the various Santa Muerte statues in Mexican stores but never really thought twice about it. This Washington Post piece (linked above) brings a whole new angle to worshiping (some use the word “cult”) Saint Death. 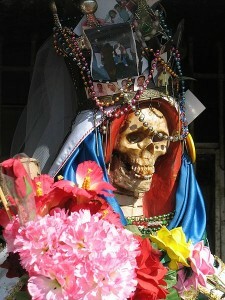 The article also includes an amazing photo montage of the monthly Saint Death festivities in Mexico City. Posted by John in Death + Popular Culture and tagged anthropology, cults, Mexico, religion. Bookmark the permalink.